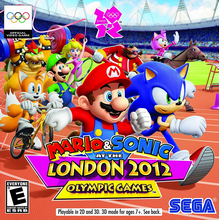 Mario & Sonic at the London 2012 Olympic Games for Nintendo 3DS was last confirmed available on July 8th, 2017. However, it is assumed the game was delisted on December 26th, 2017 alongside Mario & Sonic at the Rio 2016 Olympic Games which was announced ahead of its removal. In a post on December 20th, 2017 JapaneseNintendo.com reported that Nintendo had announced Mario & Sonic at the Rio 2016 Olympic Games would be removed from sale in Japan on December 26th. The international versions of the game, along with other Mario & Sonic at the Olympics titles, were also delisted worldwide by December 26th. As multiple Olympic titles were delisted at the same time it is assumed that Nintendo or Sega’s Olympic license had expired. All of the delisted games remain available on physical media. “Join Mario & Sonic in the world’s greatest sporting competition. With over 50 events on Nintendo 3DS to compete in, the Olympic Games have never been so much fun! Original Olympic themed events will bring a whole new dimension to the Mario & Sonic universe, with the glasses-free 3D visuals and the unique control systems that offer plenty of new and exciting ways to compete for a coveted gold medal.